Be the first to share your favorite memory, photo or story of Tim. This memorial page is dedicated for family, friends and future generations to celebrate the life of their loved one. 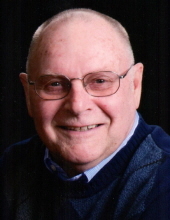 Tim G. Galliher, 75, of Shreve, passed away Tuesday, Nov. 20, 2018 at his home following a courageous battle with cancer. Tim was born April 8, 1943 in Ashland to the late Foster G. and Nellie (Daily) Galliher. He honorably served his country in Vietnam during the war in the Air Force. On June 11, 1966 he married Tami Carson, they just celebrated 52 years of marriage. Tim was a wonderful carpenter and could build just about anything. Many people in the area called Tim for his handy work and skills. He was a lifetime member of the Holmesville American Legion Post 55l and the Wooster VFW Post 1081. He was a past commander of the Shreve American Legion Post 67 and served in the color guard for many years. Tim attended the Shreve United Methodist Church; he enjoyed hunting and loved spending time with his family. Surviving in addition to his wife are two sons; Andrew (Kristen) Galliher of Lexington and Scott (Carol) Galliher of Lees Summit, MO; a daughter, Kellie (Timothy) Scheck of Mt. Vernon; 3 grandchildren, Alissa Galliher of Wooster, Peter Galliher of Lees Summit, MO and Baili Galliher of Lexington; two brothers, Kerry (Connie) Galliher of Akron and Kenny Galliher of Orlando, Fl, and a number of nieces and nephews. He is preceded in death by a grandson, Bryan Galliher; a sister and brother-in-law, Dixie (Dave) McQuillen and a brother Mike Galliher. Friends may call Fri. Nov 23, from 5:00 – 8:00 p.m. at the Shreve United Methodist Church. A committal service with military honors will be Saturday Nov. 24 at 10:00 a.m. at Sherwood Memorial Gardens. A memorial service will follow at the Shreve United Methodist at 11:30 a.m. with Rev. Mike Grant and Pastor Dennis Rinehart officiating. The family suggests in lieu of flowers memorial contributions be made to the American Cancer Society Hope Lodge, 11432 Mayfield Rd., Cleveland, OH 44106. Online condolences may be shared with the family at schlabachfh.com. Schlabach Funeral Home is assisting the family. To send flowers or a remembrance gift to the family of Tim G. Galliher, please visit our Tribute Store. "Email Address" would like to share the life celebration of Tim G. Galliher. Click on the "link" to go to share a favorite memory or leave a condolence message for the family.